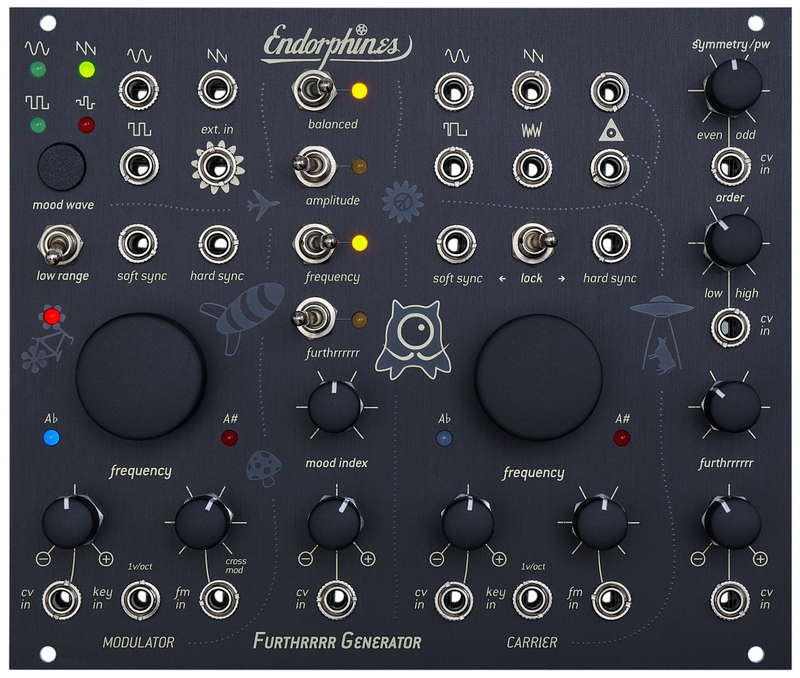 The Furthrrrr Generator by austrian manufacturer Endorphin.es is a complex completely analog oscillator inspired by the buchla 259. 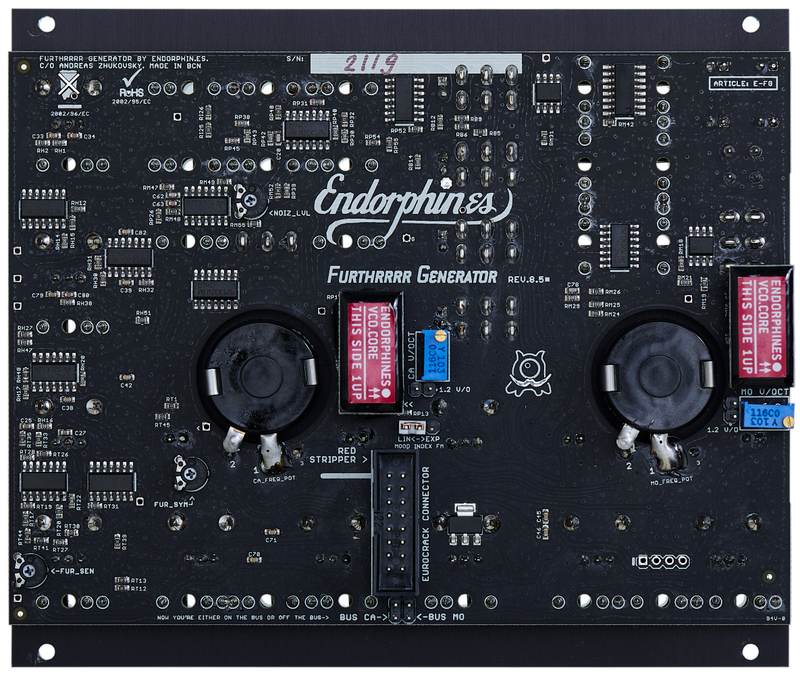 The Furthrrrr Generator has a main oscillator (carrier) with an extensive and fully voltage controllable wave mulitplier and a modulation oscillator (modulator) that can crossmodulate the carrier. Each oscillator has hard and soft sync and also featrues an integrated tuner: if both LEDs are lit the VCO is at note A. Left LED is lit at note Ab and right LED at A#. Frequency potentiometers are ten-turn models and thus allow for easy tuning. Frequency range of the VCOs is 10Hz-10kHz (and much lower in modulator´s LFO mode). The main oscillator (carrier) outputs the waveforms sine, saw, square and white noise. 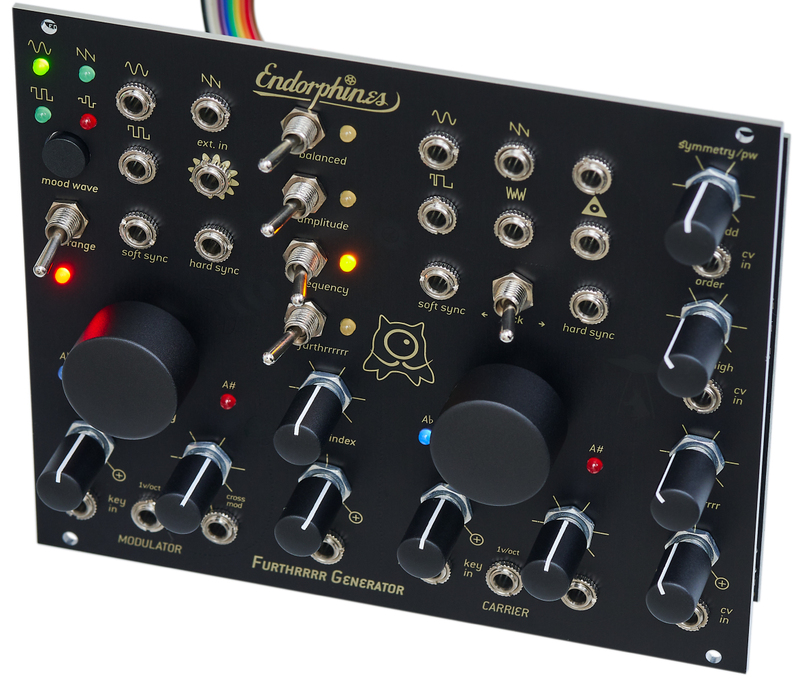 The two outputs marked with the magic eye are outputs of the "harmonic section" that generates very complex sounds by the wave multipier and it´s parameters symmetry, order and furthrrr in the module´s right hand section. Symmetry lowers the level of even harmonics and amplifies the odd harmonics (this affects the pulse wave´s width as well). Order adds saturation to the high order harmonics and resembles a low pass filter. 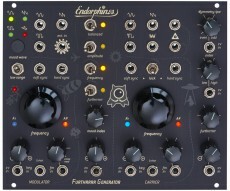 Furthrrrr alters the level of harmonics set by the other parameters and produces very interesting, partly brute sounds with lots of harmonics by clipping and folding the wave. All three parameters can be voltage controlled. The carrier oscillator also has inputs for hard and soft sync, the sync-switch can synch directly to the modulator. The modulation oscillator (modulator) has three wave forms with direct outputs: sine, saw and square. Using the internal modulation via the "mood section" the waveform is selected with a button; an additional staircase wave form is available here but it can be overridden by inserting a signal into the external input socket. A switch activates the LFO mode. The Mood section is responsible for the internal modulation of the carrier by the modulator. Switches determine the modulation destination(s) that can be activated simultaneously. These are the furthrrrr parameter of the harmonic section, the amplitude and the frequency of the carrier oscillator. The "balanced" switch acitvates the ringmodulation between both VCOs. Intensity of modulation is controlled by the "mood index" potentiometer and the according CV input with bipolar attenuator.